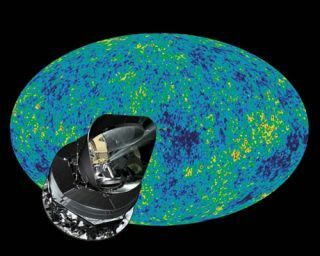 In this image, Planck is superimposed on a false-colour map of the CMB charted by NASA's WMAP satellite in 2003. Planck will improve enormously the sharpness and clarity of all the features in the map. It's notexactly Doc Brown's DeLorean from "Back to the Future," but theEuropean Space Agency's (ESA) Planck Observatory will be something of a cosmictime machine after it launches this week. Planck willbe launchedby ESA along with the Herschel Space Observatory aboard an Ariane 5 ECAlauncher from the Guiana Space Centre in Kourou, French Guiana on May 14. WhileHerschel sets its sights on the cold infrared radiation of space, Planckwill be looking at the remnants of the first light to shine freely in theuniverse, effectively allowing astronomers to look back in time. This relicradiation is called the Cosmic Microwave Background, and was discovered byaccident in 1965. The CMB is an "echo" of the Big Bang, the cooled remnant ofthe first light emitted after the universe had cooled enough to allow it totravel freely. "The cosmicmicrowave background shows us the universe directly at age 400,000 years, notthe movie, not the historical novel, but the original photons," said CharlesLawrence, NASA project scientist for Planck at JPL. The CMB canbe detected in all directions of the sky at an average temperature of 2.73 degreesKelvin (-450 degrees Fahrenheit or -270 degrees Celsius). Previous space-basedmissions have found that the temperature of the CMB varies ever so slightly indifferent areas. Planck isbuilt to resolve these variations in greater detail, which could allowscientists to better understand the conditions of the very early universe. Infact, Planck will be bringing temperatures variations into the sharpest focuspossible. The kinks inthe early universe are thought to have given rise to the structures we seein space today: galaxies, galaxy clusters and large voids. The photonsin the CMB could also tell astronomers when and how the first stars formed. Essentially,Planck will help reveal the initial conditions from which the universe we knowtoday evolved. "Planckwill give us the clearest view ever of this baby universe, showing us theresults of physical processes in the first brief moments after the Big Bang,and the starting point for the formation of stars and galaxies," Lawrence said. Planck isalso planned to determine the density of normal matter in the universe, whichwill allow astronomers to calculate the total number of atoms present in theuniverse. Planck will also probe the mysterious dark matter and dark energythough to pervade the universe ? dark matter is though to make up 90 percent ofthe matter in the universe and dark energy is thought to be the behind theacceleration of the expansion of the universe. Betterunderstanding the natureof dark energy could help answer a key question about the future of theuniverse: "Will it keep on expanding for ever or some day collapse backupon itself?" said Simon White of the Max Planck Institute forAstrophysics in Germany, which developed key software for Planck. Closer tohome, Planck will map the cold dust along the Milky Way?s spiral arms for thefirst time. The telescope will also produce a 3-D map of our galaxy?s magneticfield. Planck willalso do a little observing to overlap with Herschel, looking at distant radiogalaxies to shed light on star and galaxy formation. Planck isslated for a 15-month mission, time enough for two full surveys of the sky. Themission could be extended for another year, but even with the 15 months, "Planckwill give an answer to many important questions of cosmology," White said. "The satellite is the most powerful tool ever for studying the CosmicMicrowave Background developed."